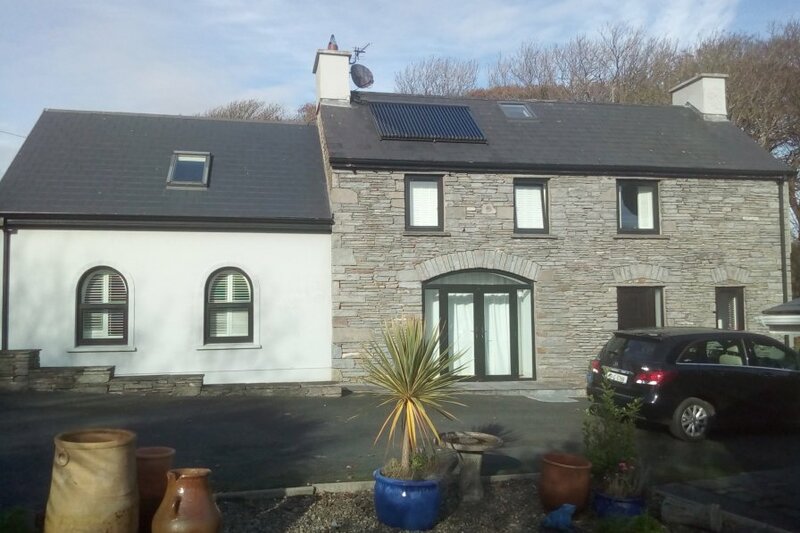 A wonderful semi-detached cottage, which overlooks the surrounding mature woodlands and river, on the same site as the owner's home, on the outskirts of Ennistymon in County Clare. Comfortably furnished throughout, this property makes an excellent base for friends and family to come and explore County Clare. Set over two floors, you enter the cottage through a side door where a well-equipped kitchen and a dining area is to your left, perfect for keeping everyone together, and with enough space for everyone at the table, you can gather to discuss the day’s experiences. Off to the right you will find a cosy sitting room with a woodburning stove, excellent for warming your toes after a day of sightseeing County Clare, and a second dining area in the same room offering a little more flexibility. There is also a ground floor shower room and upstairs are two spacious family bedrooms, both of which have an en-suite shower room. French doors in the kitchen lead out to the rear garden, which goes right down to the river, a superb spot to relax and enjoy the peaceful surroundings or dine alfresco. Just a short walk down the road is Ennistymon where you will find an array of shops, restaurants and pubs with good local Irish music being played, as well as being able to enjoy the superb scenery. If you wish to venture a little further afield there is plenty to do, including visiting the Cliffs of Moher with breathtaking views, one of the essential places to see on the popular Wild Atlantic Way. If you fancy a game of golf there are clubs in Lahinch and Doonbeg. Alternatively, catch a ferry from Doolin to the Aran Islands or enjoy a walk along The Burren Way. A comfortable property for all the family to enjoy at any time of the year.